A sepia tone is a reddish brown monochrome tint. The effect renders your photo with a warm antique feeling. Photoshop Elements offers several methods that you can use to create a sepia tone. Some methods render your photos with a more rust appearance and less warmth than others. If you begin with a color photo, you need to convert it to black and white. Choose Enhance→Adjust Color→Remove Color to eliminate the color. You can also use Enhance→Convert to Black and White. If you begin with a grayscale image, choose Image→Mode→RGB Color. The photo needs to be black and white and in the RGB color mode. Then proceed with one of the four methods outlined here. Ideally, it’s best to use an adjustment layer when possible. 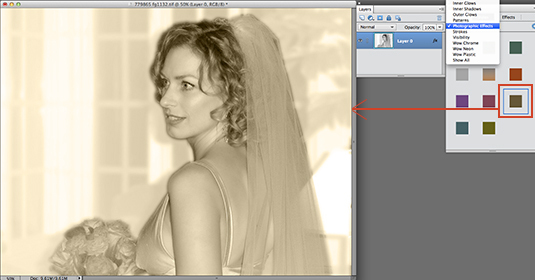 This method gives you an opportunity to reduce opacity in the Layers panel if you want to lighten the effect. Select the Colorize check box in the Hue/Saturation panel and move the Hue and Saturation sliders to 30. This adjustment should be around 30 and no more than +/- 3. Move the Lightness slider to about 10. This step creates a mild warm sepia effect. 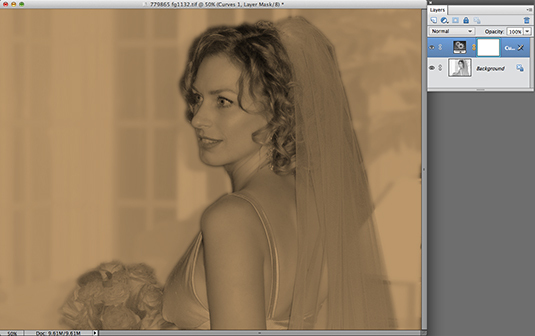 This method creates a sepia tone with a little less brown than the first method. Begin with a grayscale image in RGB mode and open the Effects panel. Click the Styles tab and open the drop-down menu. Choose Photographic Effects and locate the Sepia Tone effect. It’s the last style in the third row. Drag the sepia tone swatch to the image. This method requires you to have Adobe Photoshop or ask someone with Photoshop to help you. Open a photo in Photoshop. Any photo will do. Just make sure the photo is in RGB color mode. Create a new adjustment layer by choosing Layer→New Adjustment Layer→Curves. Choose Red from the drop-down menu and change the Output value to 141. Choose Green from the drop-down menu and choose 131. Choose Blue from the drop-down menu and change the Output value to 119. Note that the Input box should show 128. Copy the adjustment layer to a blank document by choosing File→New. Set the width and height to a small value such as 36 pixels. Choose Transparent from the Color Mode drop-down menu. Click OK to create the new document with a transparent layer. Drag the Curves Adjustment Layer from the document where you made your Curves adjustments to the new document. 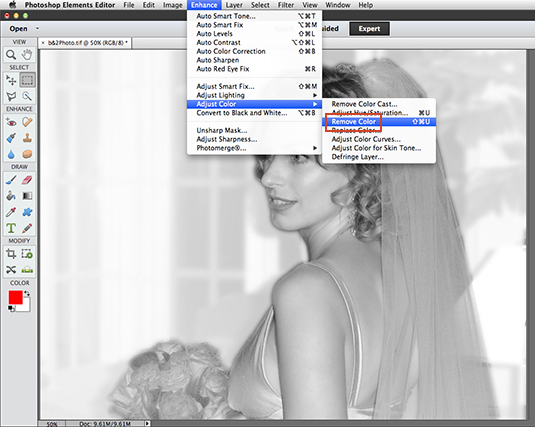 Choose File→Save and save the new file as a Photoshop (PSD) document. 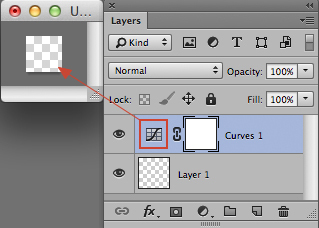 This step preserves the layer and you can open the file in Photoshop Elements. Create a second Curves adjustment. For another sepia tone effect, create a much darker adjustment. Follow the same steps to open the Curves Adjustment Layer. In the Curves settings, click the top-right corner on the diagonal line and set the output levels to R=187, G=151, and B=107. Create a new file and drag the Curves Adjustment Layer to the new file. Save this file as DarkSepia.psd. Open the photo that you want to use for a sepia tone in Photoshop Elements. Be sure the file is a black and white photo in RGB color mode. Open the DarkSepia.psd file in Photoshop Elements. You should see just a layer in the file with the Curves adjustment. Drag the layer to the file you want to apply the sepia tone. In this example, the high-key photo needs a much lighter sepia effect. 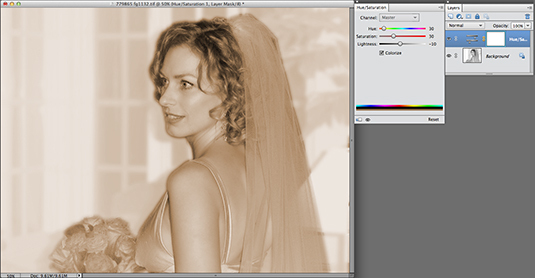 Open the LiteSepia file and drag the layer to the file you want to apply the sepia effect. In this photo, the light sepia effect created in Photoshop works well and it appears much better than it would with either of the other two methods. If you make Curves adjustments in Photoshop and apply them in Photoshop Elements, you can adjust the Opacity slider in the Layers panel to lighten the effect. If you don’t have access to creating Curves adjustments in Photoshop, you can make some similar adjustments by using a Levels Layer Adjustment in Photoshop Elements. Create an adjustment layer and choose Levels for the type. 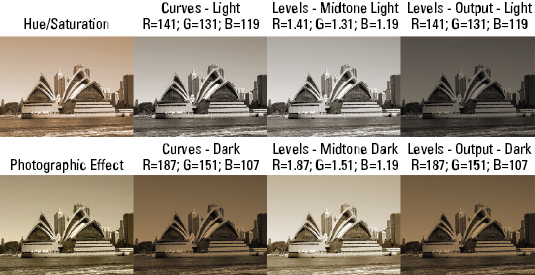 For a dark sepia effect, edit the RGB channels on the Output Levels. For this photo, use R=187, G=151, and B= 107. 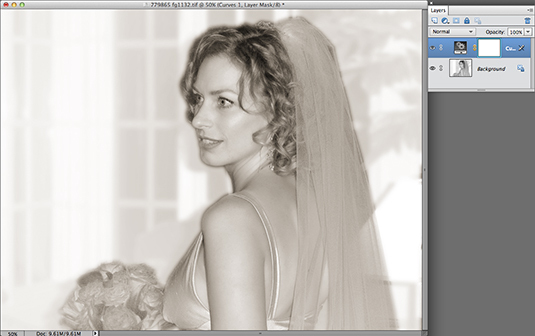 The results of the edits are very close to the same values used in the Photoshop Curves settings. The Elements adjustment has a tiny bit more yellow in the sepia tone. Edit the Midtone slider in the Levels panel. You can also edit the vales for each channel along the midtone value. For this photo, the same values as the Output levels in the Photoshop Curves adjustments where R= 1.41, G=1.31, and B=1.19 work well. The results of this adjustment is a very nice sepia effect and quite similar to the Curves adjustments used in Photoshop for the same values. To find the sepia effect that works well for you, play with the Midtone slider and the Output Levels adjustment in a new Layers Adjustment Layer.